The Dublin Bay Project was the largest urban drainage project ever undertaken in Ireland, providing for integrated networks and treatment at Ringsend for the whole Greater Dublin Catchment. 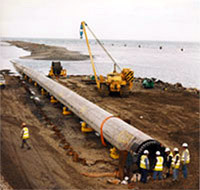 Alfred McAlpine Pipeline Construction were responsible for constructing a 10Km x 56” OD subsea pipeline across Dublin Bay for the Dublin Corporation. The pipeline was internally lined with polyurethane and was built in 350m string lengths at a site in Ringsend, Dublin from where it was pulled out across the bay.